Use the arrows to read through stories. 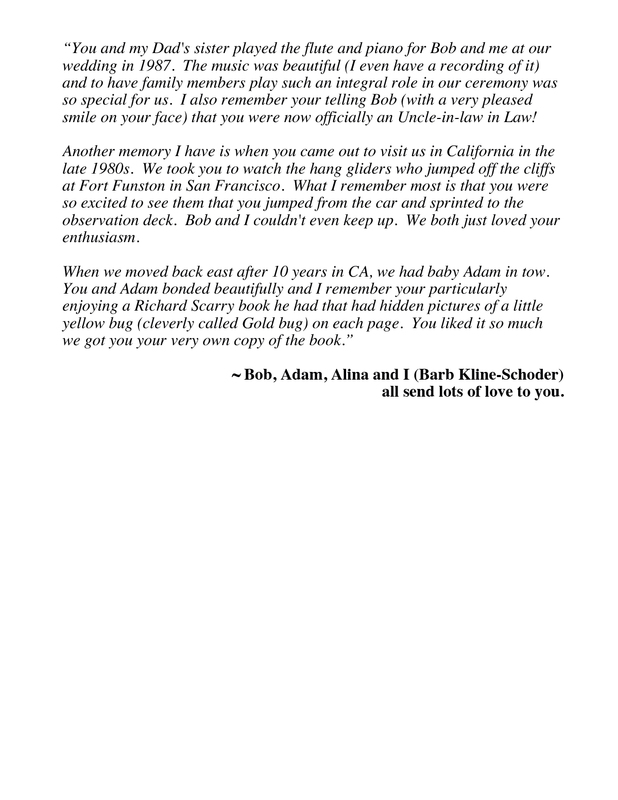 Click on a story for a larger image. 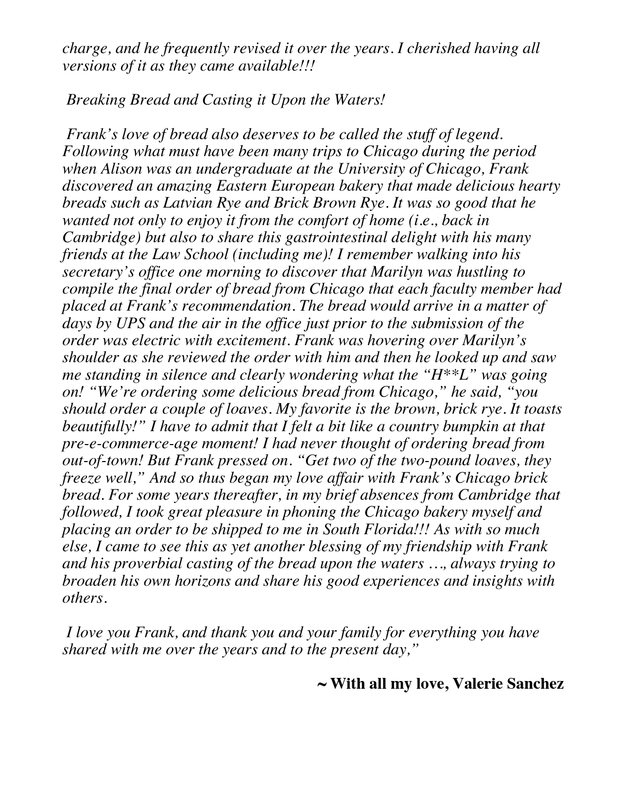 Do you have a ‘Frank Story’? If so, we would love to hear it! Simply type it in the comment box below and we will add it. 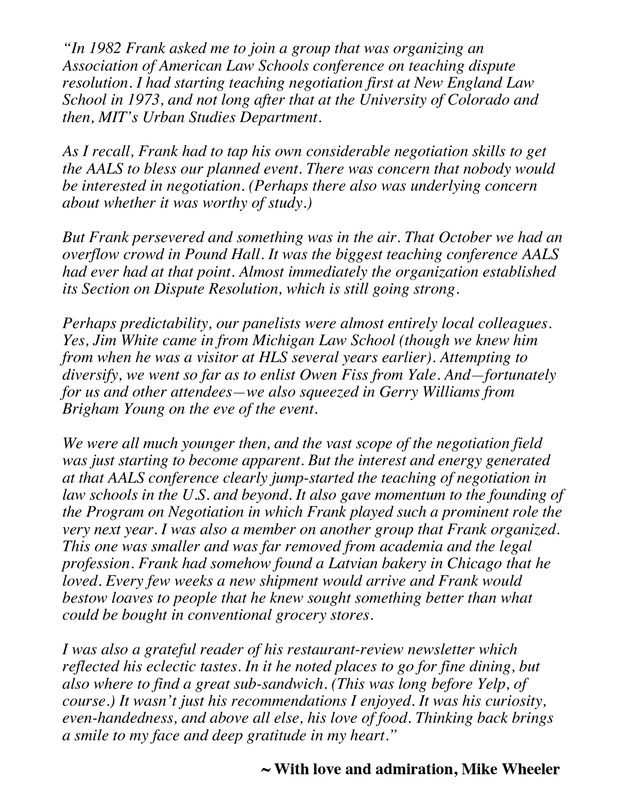 My initial encounter with Frank was in the early 80’s when I became the first visiting fellow at the Program on Negotiation. 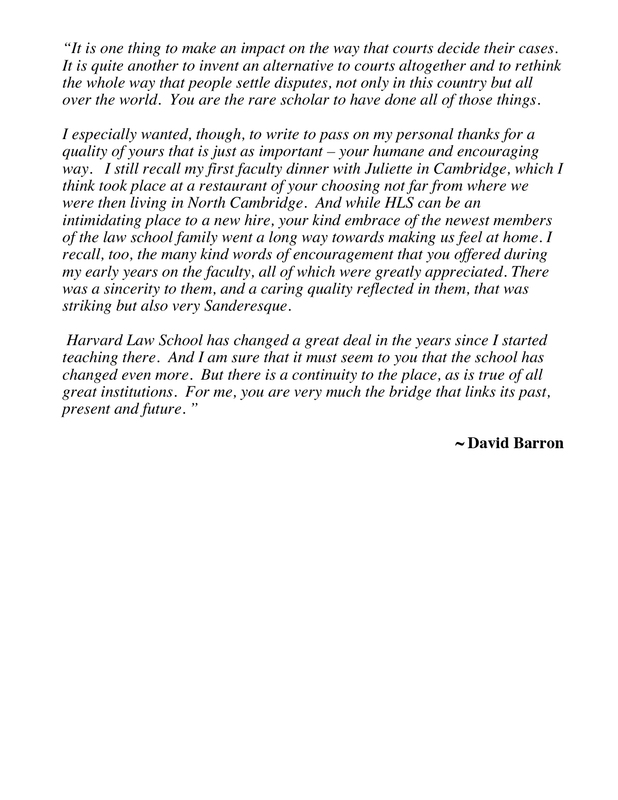 My office was in the Harvard Law School. I was a mediator of complex public disputes, grateful for the opportunity to step back and write about the work I had been doing with colleagues across the country. Larry Susskind had warned me that there might be some issues with the way I was received. At that time there were no women or people of color on the faculty. 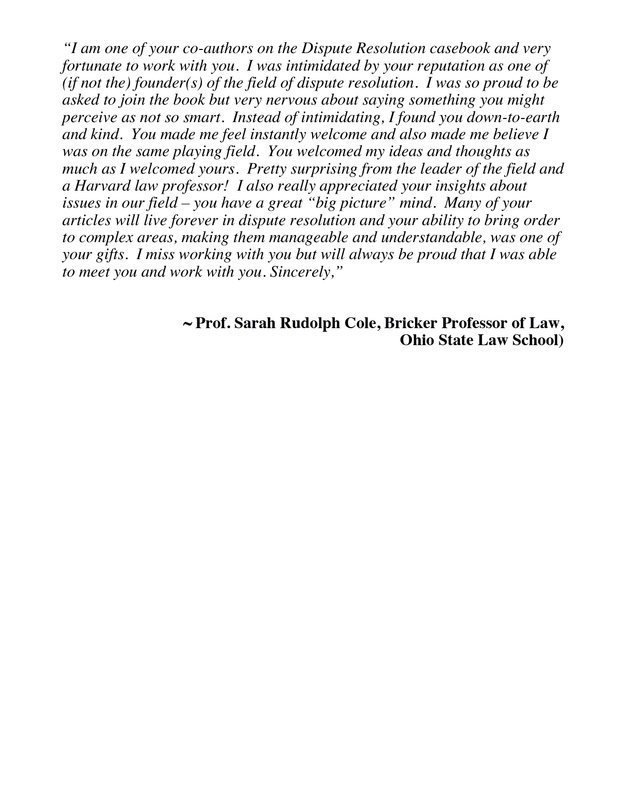 I was a young female, non-New Englander, non-Harvard, non-lawyer. 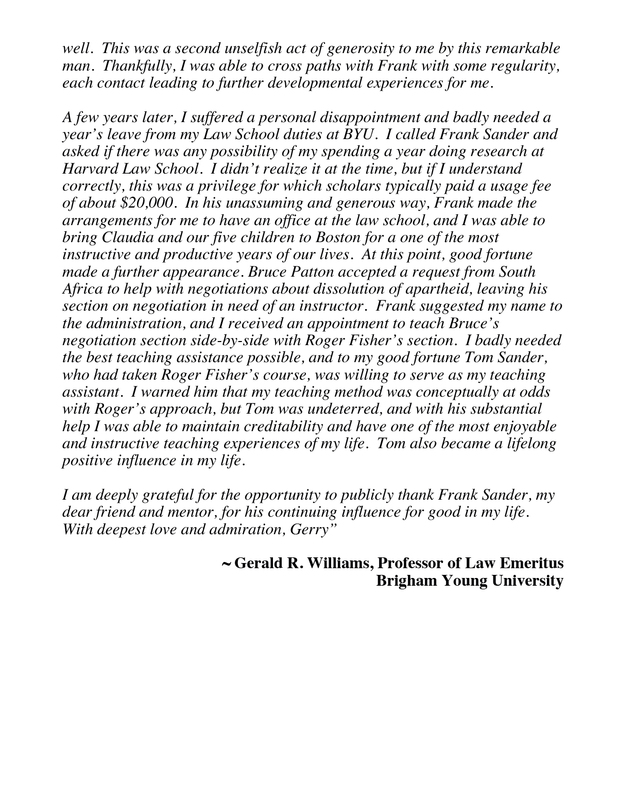 Frank was the one faculty member at the law school who reached out to me. He was genuinely curious about my mediation experiences. He invited me to one of his classes to describe my work. 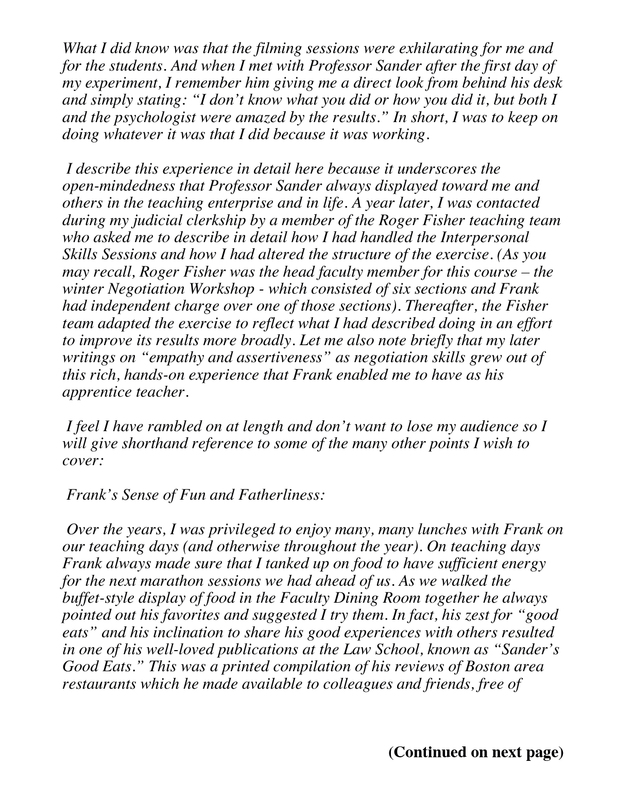 I maintained contact with Frank over the years through the Senior Mediators Group always enjoying his contributions and appreciative of his approachable demeanor. I later met Emily and had the opportunity to spend some time with her. Emily, I later learned, was close to a dear Quaker friend of mine. I gained further insight into Frank’s hospitable, inclusive, non-judgmental soul. From the earliest days onward, Frank provided steady intellectual fuel for the development of the alternative dispute resolution field. His academic contributions are legion, but his legacy does not stop there. 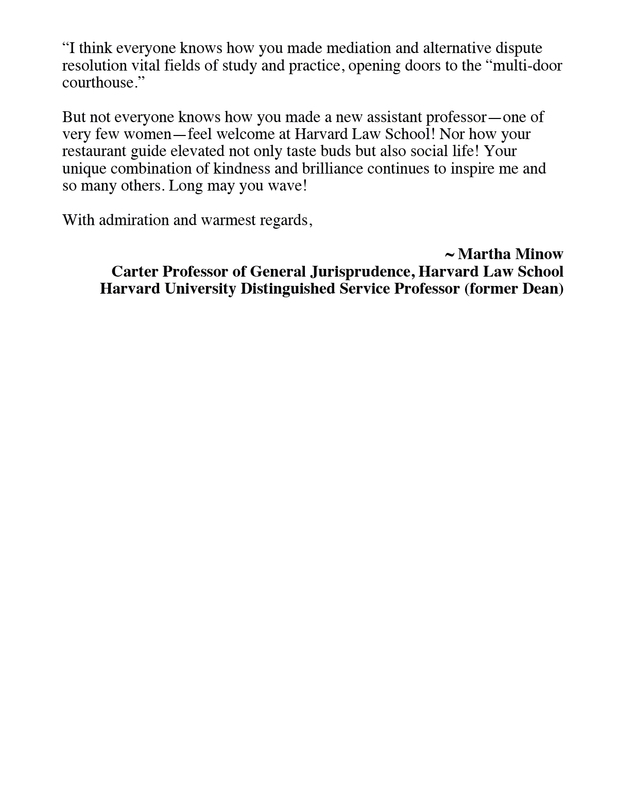 He generously mentored countless students and aspiring mediators through his advice, encouragement, and by being an outstanding role model of one who truly listens. I was privileged to know Frank for several decades and will continue to be inspired by his work and deeds. 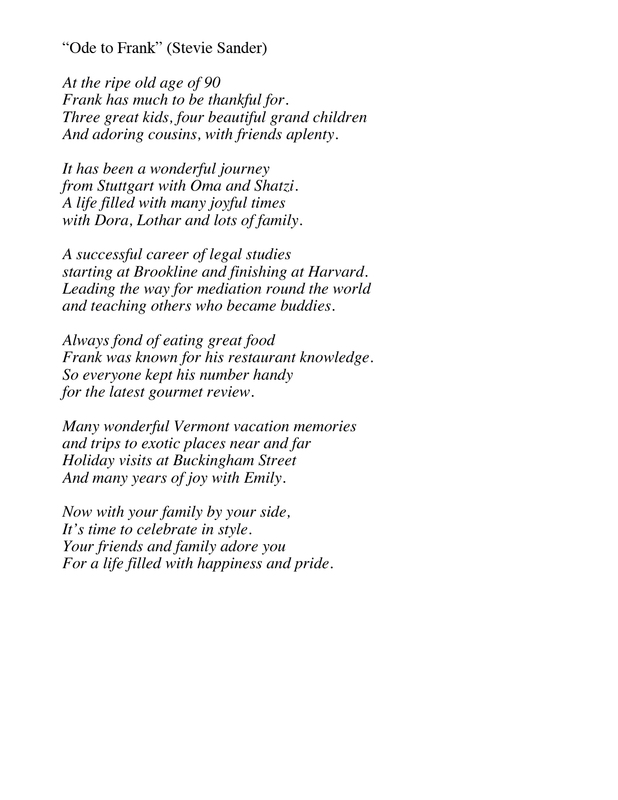 The notice of the celebration of Frank’s life arrived in the fall, just when I was remembering happy “shunpiking”—drives with Frank and his parents. Tootsie would find the apple and cider stands as we leisurely progressed through rural Massachusetts. While we dated, highlights were times with Frank’s family. I particularly envied their musical family joyously playing together. What do I remember most about Frank Sander? Most of all his character. 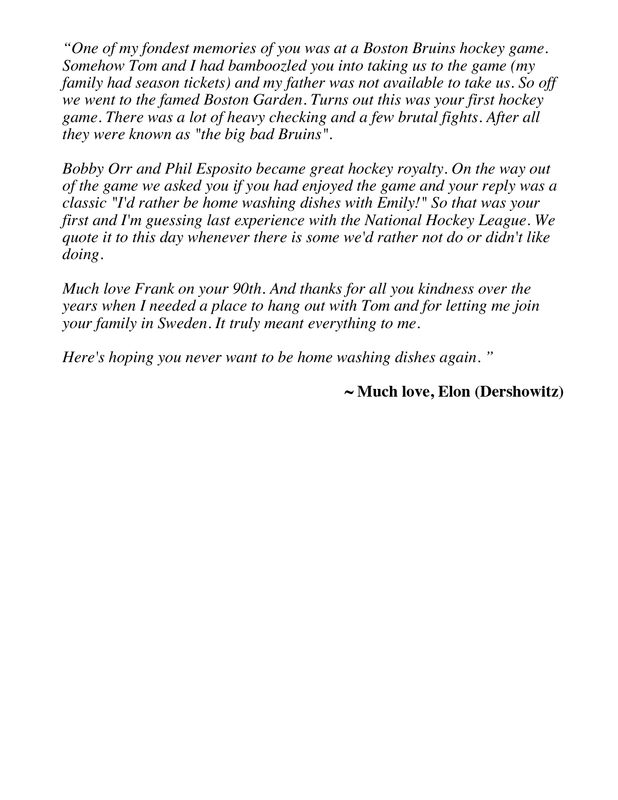 Frank was a mensch. Like so many others, I benefitted from his acts of kindness, his warmth, his empathy, and his wise counsel. 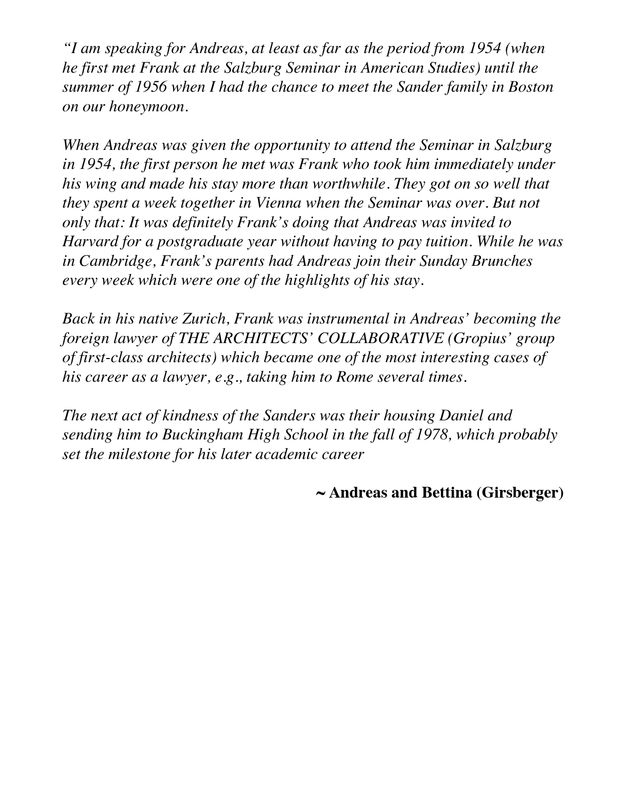 I recall with pleasure his passion for classical music and Michelin starred restaurants. 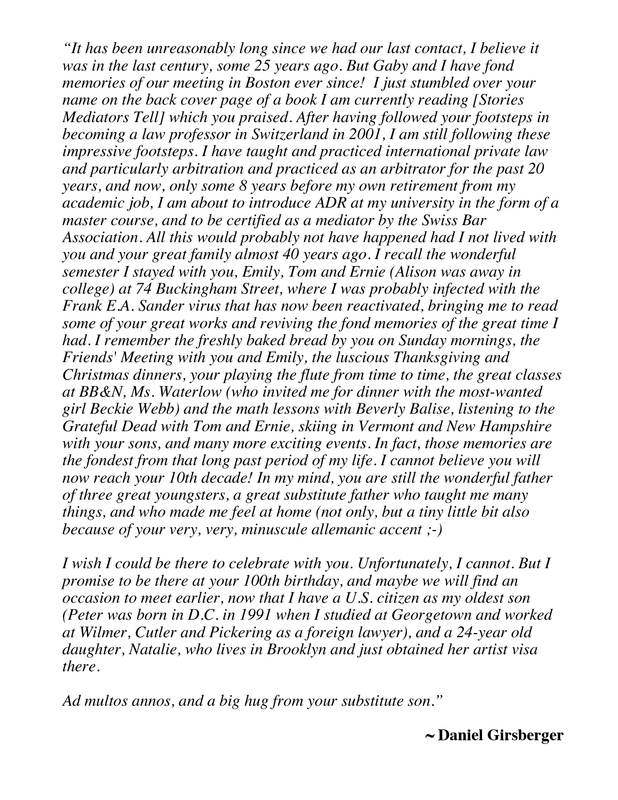 I recollect his abiding love for Emily, and his pride in Emily, Tom, Ernie and Alison. 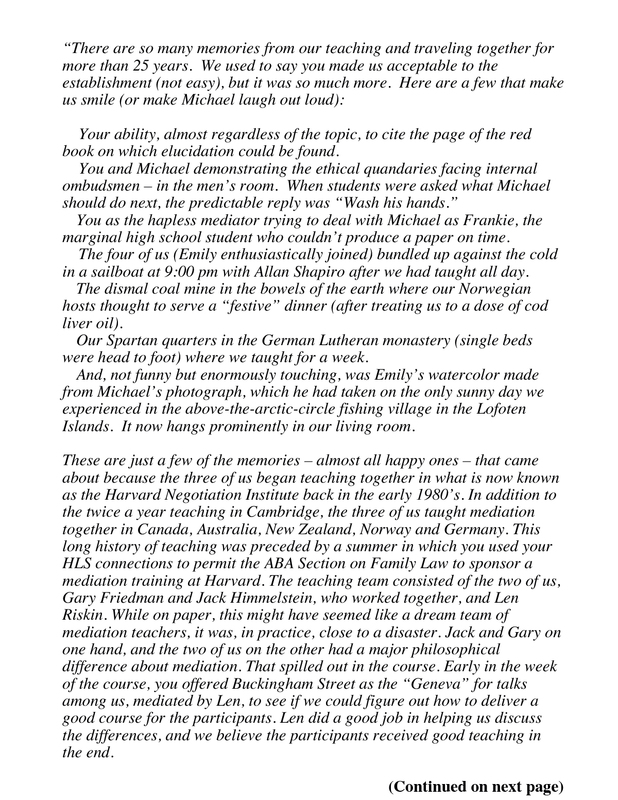 What I will also never forget is Frank’s extraordinary life’s journey so wonderfully chronicled in this website. During a two-hour road trip with him, some twenty years ago, Frank shared many of the details with me. Frank came to America as a refugee. Though he had no trace of an accent, his childhood was spent in Germany. 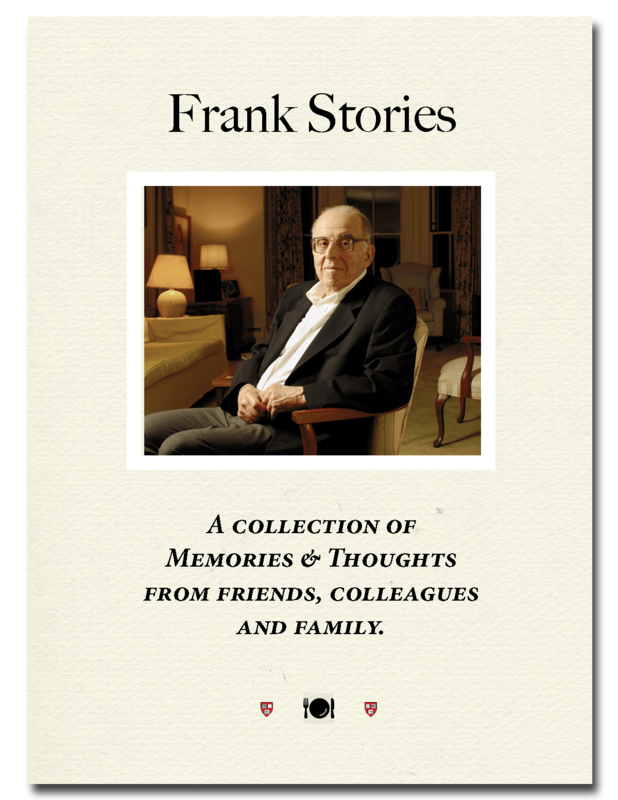 When Frank was 11, essentially knowing no English, he was sent alone to England on a Kindertransport as part of the effort to save Jewish children. At the age of 13, he came to America with his father and mother. 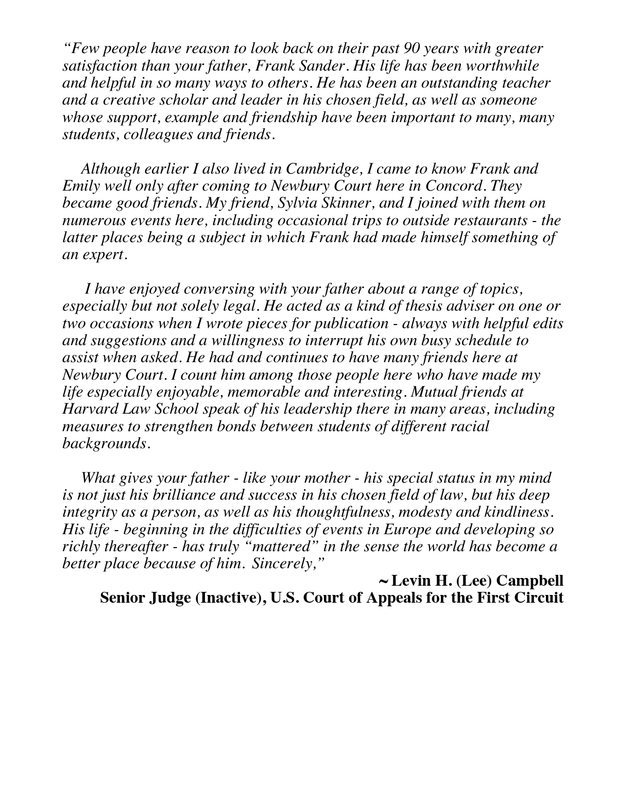 His life in this country thereafter was the stuff of the American dream: a magna graduate of Harvard College and Harvard Law School; clerkships on the First Circuit and the Supreme Court, and a professorship at Harvard Law School. 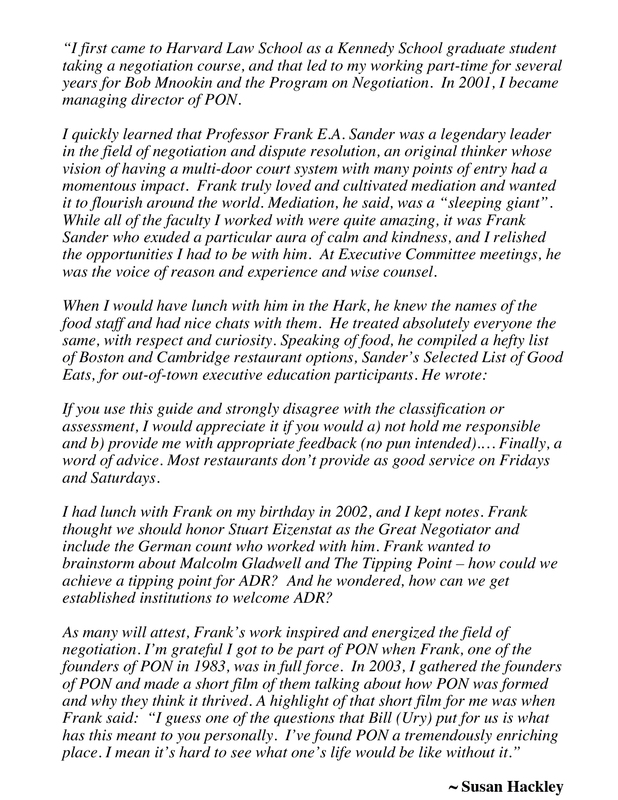 Over the years, Frank made seminal contributions in the field of conflict resolution and served as a treasured mentor to many others who would go on to become leaders in the field, thanks to Frank’s instrumental direction and support. 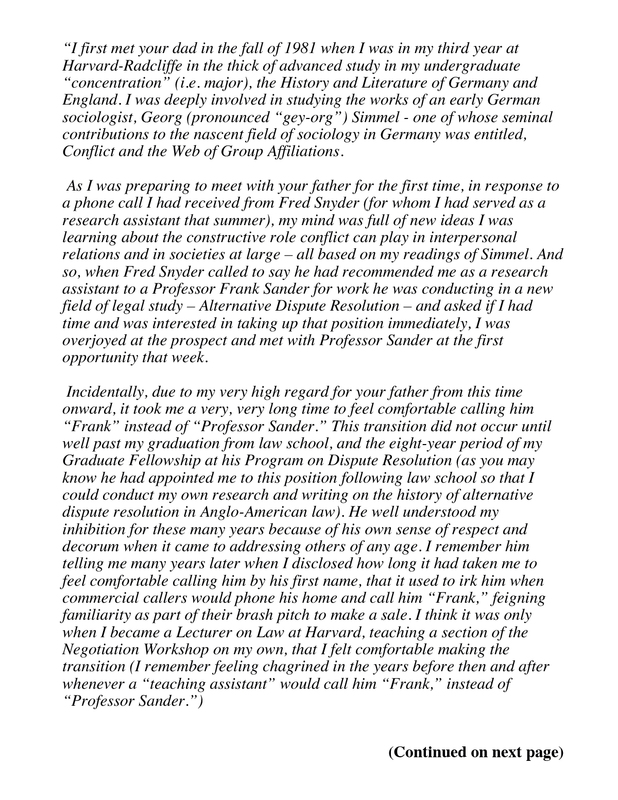 I feel deeply blessed to have known Frank as my teacher, my professional colleague and, most importantly, my friend. Edith (Edie) B. Primm, Esq. 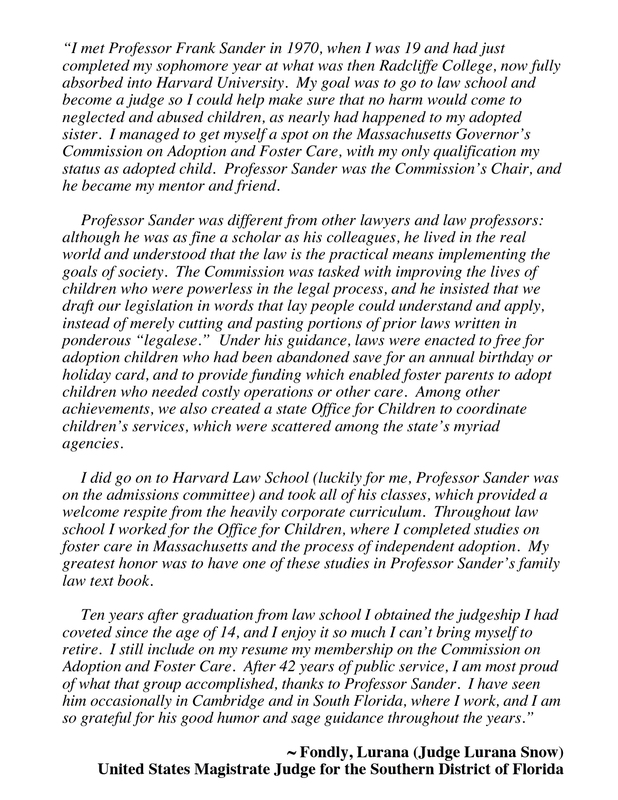 My remarks flow from being fortunate enough not only to have been in the first generation of ADR practitioners, but also from The Justice Center of Atlanta’s (formerly The Neighborhood Justice Center of Atlanta) being a part of the three national neighborhood justice centers pilot project -along with Venice-Mar Vista, California and Kansas City, Missouri- inspired by Frank’s speech in April 1976 at The Pound Conference –ironically, 42 years ago this year–, and implemented a year later by then U.S. Attorney General Griffin Bell. In short, I was privileged to be there at the beginning. I am reminded of the line in Shakespeare’s play, “Henry V”, on the eve of the Battle of Agincourt, when the king says “…and gentlemen in England now a-bed shall think themselves accursed they were not here….” While my colleagues who have joined our profession post 1976 are surely not accursed, being at the beginning with all the uncertainty, fear and potential looming ahead was an incredible experience that is hard to put into words! 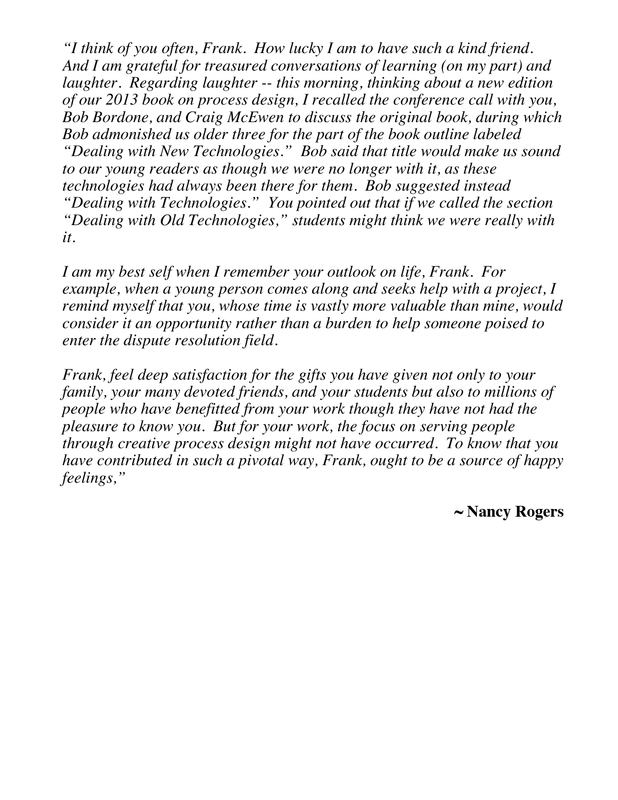 We had the challenge of implementing Frank’s ideas without a clear road map and lots of resistance. Who are these “MEDITATORS” –(I DID MEAN MEDITATORS AS SO MANY PEOPLE CALLED US THAT ) to tell us how to resolve disputes!! They do come –with a nudge from the judge; more settle than not; and very few agreements are breached. 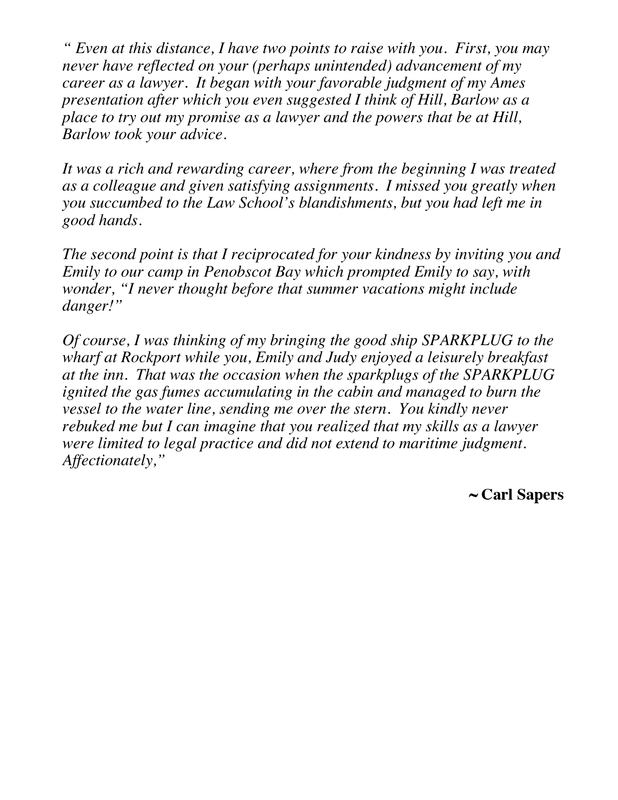 From day one, we believed Frank’s idea of working with and not separate from the courts was key to obtaining referrals. We also listened when he said mandatory referrals to mediation might be necessary as long as the parties were NOT mandated by courts or mediators to settle. 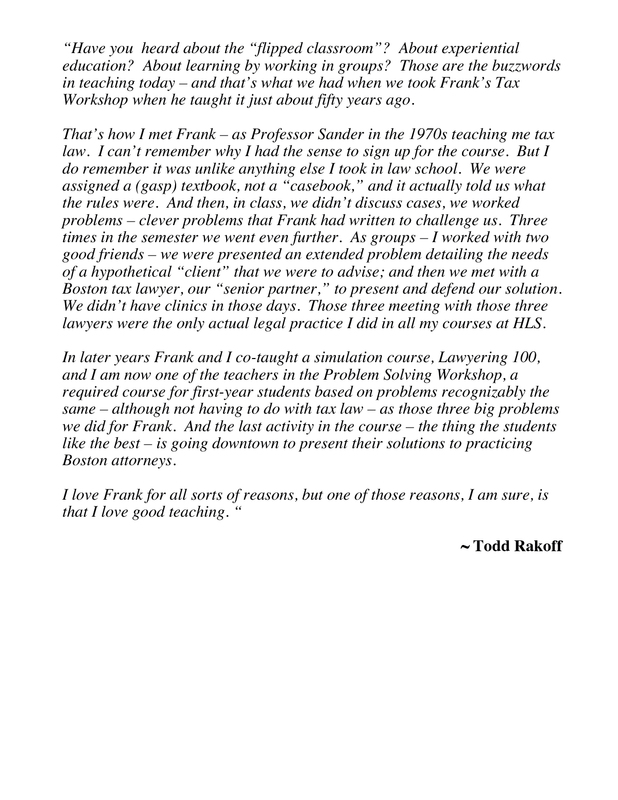 The hot debate over voluntary versus court-ordered mediation is belied by Frank’s wisdom. 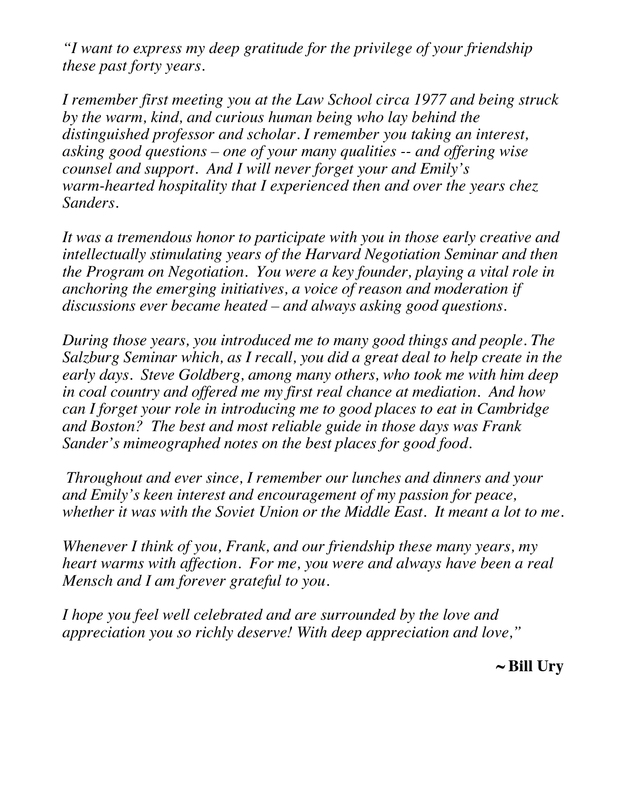 The last 40 years implementing Frank’s vision has been an exciting journey from courts to schools; to class action lawsuit settlements, substituting mediation and arbitration for litigation; to administrative agencies dealing with Title VII of The Civil Rights Act of 1964, as amended in 1991; to myriads of workplace disputes; to major environmental and public policy disputes. JCA alone has handled 1,500-3,000 referrals for mediation yearly during this time period. 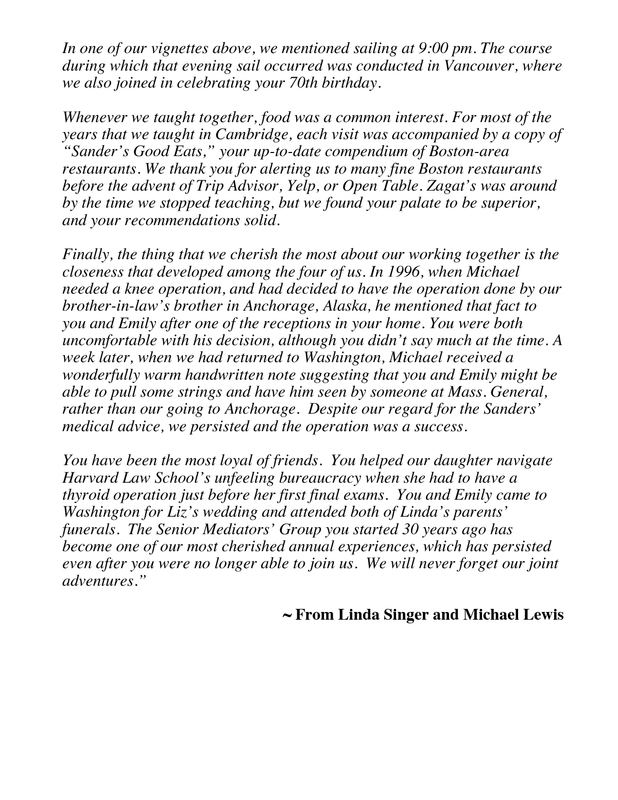 It is my fervent hope that the Dispute Resolution Section and all ADR practitioners will go beyond these reflections and tributes following Frank’s death to ensure that the fascinating, improbable history of Frank Sander’s creating and nurturing the ADR field will not be lost. 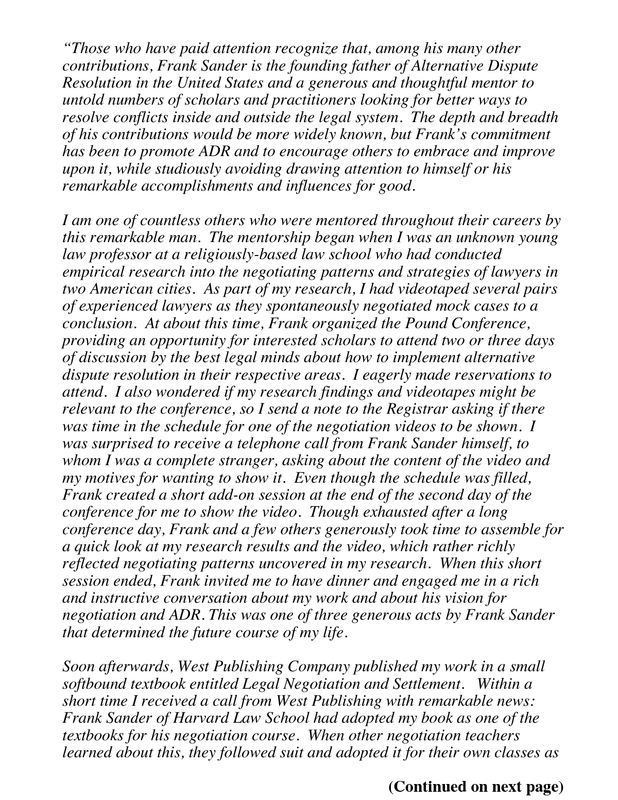 I am grateful and privileged to have been a part of implementing his vision of greater access to ADR for all, regardless of income or status, from the beginning of our profession. 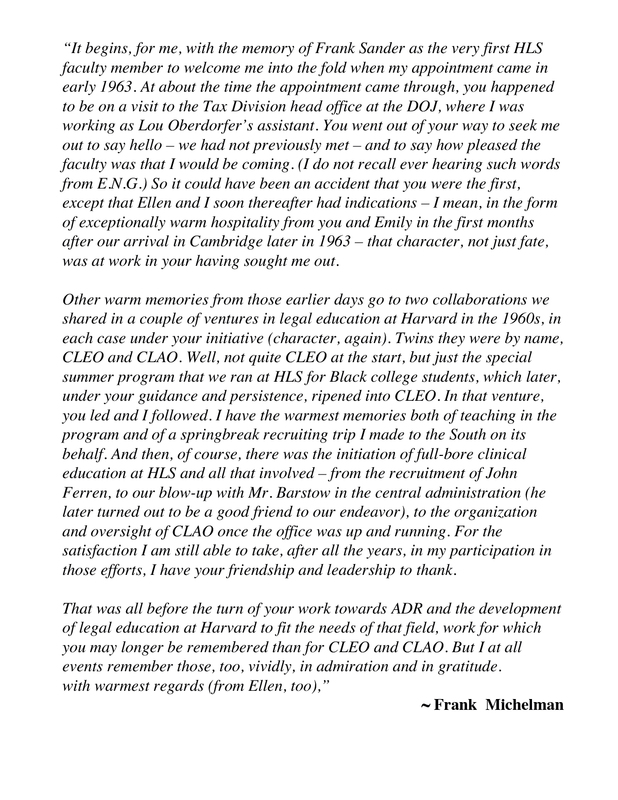 May Frank rest in peace in God’s care, and may we continue to honor him by our work in ADR for years to come.